UPS continues its aggressive investments in a wide range of alternative fuel trucks with the announcement this week that it will spend an additional $130 million in compressed natural gas vehicles, including 400 semi-tractors and 330 terminal trucks – which move trailers around UPS hubs - trucks and five more fueling stations, as the parcel giant continues to be a catalyst for broader adoption of natural gas vehicles. UPS had made earlier investments of $100 million in 2016 and $90 million in 2017 in natural gas powered trucks. The company plans to have one in four new vehicles it purchases in 2020 to use alternative fuels or advanced technologies, such as a hybrid truck or one that uses lightweight materials to improve fuel efficiency. The 400 long haul will be supplied by Freightliner and Kenworth Truck Co. and 330 terminal trucks by Terminal Investment Corp. That will boost UPS’s current CNG fleet by about 19%. The new CNG stations will be in Goodyear, AZ, Plainfield, IN., Edgerton, KA., Fort Worth, TX, and Arlington, TX. UPS operates more than 50 natural gas fueling stations nationwide. It also has stations in Vancouver, British Columbia, and Tamworth, United Kingdom. The UPS investment is part of a broader effort by the company to reduce its greenhouse-gas emissions from its ground operations by 12% by 2025. What’s more, the company plans to have one in four new vehicles it purchases in 2020 to use alternative fuels or advanced technologies, such as a hybrid truck or one that uses lightweight materials to improve fuel efficiency. UPS also it plans to replace 40% of all fuel for its ground operations with sources other than conventional gasoline and diesel, saying that from 2008 to 2018 UPS will have invested more than $1 billion in alternative-fuel and advanced-technology vehicles and fueling stations. Using its “Rolling Laboratory” approach, UPS deploys 9,100 low-emission vehicles to determine which technology works best in each route configuration. This includes all-electric, hybrid electric, hydraulic hybrid, ethanol, CNG, LNG and propane. But the move may also help UPS cut operating costs. Natural gas trucks have lost some market momentum in the past few years as rock bottom diesel fuel prices meant the ROI from the switch to natural gas looked much less attractive. But now, the cost of oil and diesel has been climbing again. Over the past four weeks, the average on-highway price has stayed between $3.23 to $3.28 per gallon, about 75 cents or about 20% year over year. So the savings from a switch to natural gas begins to look financially attractive again, as natural gas prices are actually down a bit over the past 12 months. 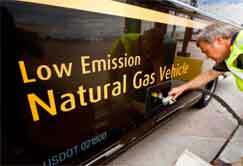 Any reaction to UPS’ latest move in natural gas trucks? Let us know your thoughts at the Feedback button below.